Inventory clearance blowout price. Limited quantities available so act fast before they're gone. - Shipping weight 2 lb. 10 oz. The original stabilizer - since 1976 - twenty-five years of proven performance. Eliminates visibility hazards during acceleration. "Thin" anti-drag stabilizer improves performance, eliminates cavitation. 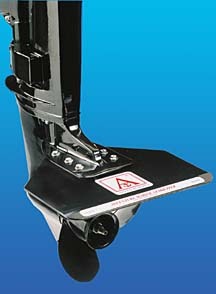 Stabilizer is mounted under anti-cavitation plate of outboard motors and inboard/outboard motors. Once cruising speed is reached, reduce RPM and still maintain same speed. Save fuel and wear and tear. 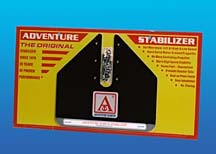 Stabilizer extends aft of motor and reduces wake for skiers. More solid water around propeller improves performance and top speed. Easy installation, all mounting hardware supplied. Made of high tensile 6061-T6 marine grade aluminum. The rear 1" has 8 degree trim-tab bend down. Electrostatically powder coated in black. No returns on blowout priced products. 4 - 12 HP. 1/8" Thin by 12" wide. Shipping weight 2 lb. 10 oz. 15 - 130 HP. 3/16" Thin by 20" wide. Shipping weight 4 lb. 12 oz. 150 - 200 HP. 1/4" Thin by 20" wide. Shipping weight 5 lb. 4 oz. See all Engine Stabilizer Planing Fins here. "Just thought I'd drop you a quick note to let you know I had a chance to run my 12-1/2' portable with the 1000 stabilizer on my Nissan 5hp. I am very happy with the results! I was having some ventilation issues on my rig, which the stabilizer has completely eliminated. In addition, my hole shot has improved and I can maintain planing speed at lower throttle. Yours is the only product I've found that is made specifically for smaller motors and actually fits on my Nissan. Many thanks again for your help." "I would like to take this opportunity to let you know that since I have installed your Stabilizer to my twin 250hp Yamaha outboard motors on my 30' Grady White Marlin boat, it has made a drastic difference in performance! The aluminum stabilizer planes the 12,000 lb. boat in an instant and allows me to stay up even in lower RPM range, which in the process also increases my cruising range with a more economical fuel consumption. This is to let you know, I am very pleased with the stabilizer and your service." "We tried the stabilizer on the new long shaft 20hp with our new boats yesterday, and found it gave a quicker, flatter acceleration - and no spray. As we are going to go up front with 16 boats (20hp - 35hp Johnsons) we would like to order a dozen. Please advise us on the cost etc., we will be opening May 1st at the Anchor Inn. Thank You." "I'm going to keep the 15 horsepower Evinrude 2 stroke because of its extremly low profile... stealthy for winter duck hunting!!!! I removed and junked the hydrofoil... ready to mount a new model 1000 stabilizer in its place. Bankes boats are right on the money regards transom mounting heights / cavitation plate placement for peak efficiency. Your product functioned flawlessly and dramaticaly enhanced performance on my Yamaha 4 stroke, while the hydrofoil type product, (without ample water above the wing) was rendered totally ineffective and detrimental to performance. I decided on the 1000 because either model will fit the Evinrude, it will be used on the same boat as the Yamaha with 1000 so i'm opting in favor of it's portability. Thank you very much!!!" "These stabilizers (not to be confused with common hydrofoil type) really enhance performance on the Intruder! With any appropriate power your customers will be amazed. You should definately try a model 1100 on the Dominator... It will make a 25HP act like a 40 but without the increase in fuel."